It's been years since I've ridden a bike. Well, with any seriousness, but for about a year I've been wanting a bicycle. I've looked at all sorts. I've made good use of my friends in the education process too. Richard Williams and Bob Bowden have probably had enough of me and probably sigh in frustration every time they see an instant message from me. The next bike on my list was the Gary Fisher Wahoo Disc. The riding position is a little different on this bike, but it felt pretty good too. The Fisher had a good feel too. However, once again the dealer didn't have a Wahoo in my size. They did have a Marlin that was was able to try. It was the same frame and layout, just different components. One thing that struck me as odd was though the specs online stated certain things, but the Wahoo at the shop was slightly different. For instance the front derailleur on the bike was a Shimono SIS, but according to the specs it should have been a Shimano Acera. While I'm not entirely sure it makes much of a difference, it was just puzzling to a neophyte mountain bike purchaser. Trek's 6000 was another bike I liked, but, as usual, there wasn't a 6000 in stock at the dealer. They did have a 4900 (basically the 2006 version of the 6000) for me to try. It had a great feel, and seemed like a very well made bike. This bike had some nice features, and I wish I could have just bought it, however the 4900 was on hold for another customer. As a matter of fact, when I walked through the door I saw the salesman putting a tag on a bike - turns out it was the 4900 - just my luck! The last bike on my list today is the Jamis Durango 2.0. It's probably the better of the bikes that I've considered. It's in a higher price point ($775) than the others. I've also considered the Durango 1.0 (same price range of the others). It has been my goal to buy a bike by the end of this month, but as I get closer to making a real decision I'm starting to get anxious about having the bike. Of the bikes above I feel drawn to the Specialized. It just felt really good when I was riding it. I'm almost ready to grab that one, but I want the most value for my hard earned money. 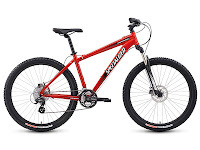 I'm hoping I can get the dealer to get close to my budget with the Specialized Hardrock Pro Disc. Now that I've tried out a few bikes, and in the process of negotiating prices less than MSRP, I can hardly wait!! !